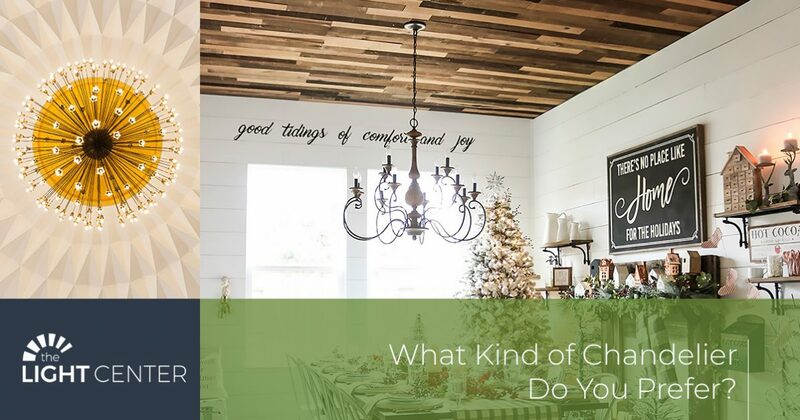 What Kind of Chandelier Do You Prefer? At The Light Center in Fort Collins, we love helping people find the right fixtures for their home. When it comes to lighting design, a chandelier can be the centerpiece of many rooms in your home. The chandelier has evolved quite a bit over the years in terms of appearance and technology, but it’s role as a focal point in a room has changed very little. If you’re looking for new chandeliers, then there might be a style that you prefer. Our showroom is filled with amazing options, and our expert staff can help you find the right fixture for any space. When you think of chandeliers, you may envision a grand fixture that hangs in the lobby of your favorite five-star hotel. You may also think of the elaborate chandelier that hung in your grandmother’s dining room and shone brightly during every family holiday dinner. Ornate chandeliers still have a place in modern lighting design, and if you’ve been thinking about adding one to your home, then visit our store today. We have crystal chandeliers, chandeliers with shades, and chandelier charms that can make your home look and feel like you’ve always wanted. If elaborate and ornate light fixtures aren’t your favorite, then you might lean more towards minimal designs with clean lines and few to no embellishments. You don’t need a grand fixture in your entryway to greet visitors, but rather, a small, powerful light that still makes a statement. You might be updating your living room, and you want a contemporary fixture that has straight lines and bare bulbs. You might want to add a chandelier to your covered back patio, and with our selection of outdoor options, you can find something that fits your style. Once you know what style of chandelier you prefer, it’s time to choose the size of fixture that will fit your home. You don’t want a chandelier that’s too large for a room, as it can make the space feel smaller or overwhelm it with too much light. You also don’t want a fixture that’s too small, since it won’t produce enough light and may not create the focal point that you want. There are formulas and equations for calculating the proper chandelier size for any room in your house, and our lighting experts can help you every step of the way. If you have the dimensions of the room you want to add a chandelier to, then we can provide the proper fixture size, along with several recommendations for style and design. We hope that if you’re looking for new chandeliers for your home that you’ll stop by our showroom today. We’re proud to serve the people of Fort Collins and the surrounding area, and we’ve provided exceptional lighting options for more than 45 years. As your full-service lighting store in Northern Colorado, we can make sure that you have fixtures for any project, big or small.